These tasty little guys pair perfectly with the awesome steak chili. They are a little time consuming but can be made the day before and refrigerated or up to a week before if frozen. This, along with the chili came from the geniuses at Cuisine at Home Magazine. The recipe makes a generous amount of filling. 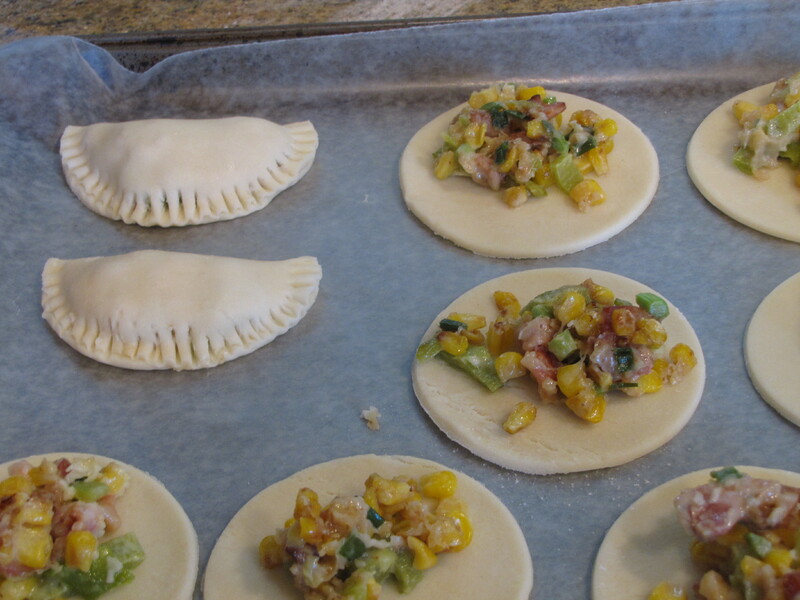 The empanadas can’t be over filled or you won’t be able to seal them, yet the recipe makes twice what you’ll need. 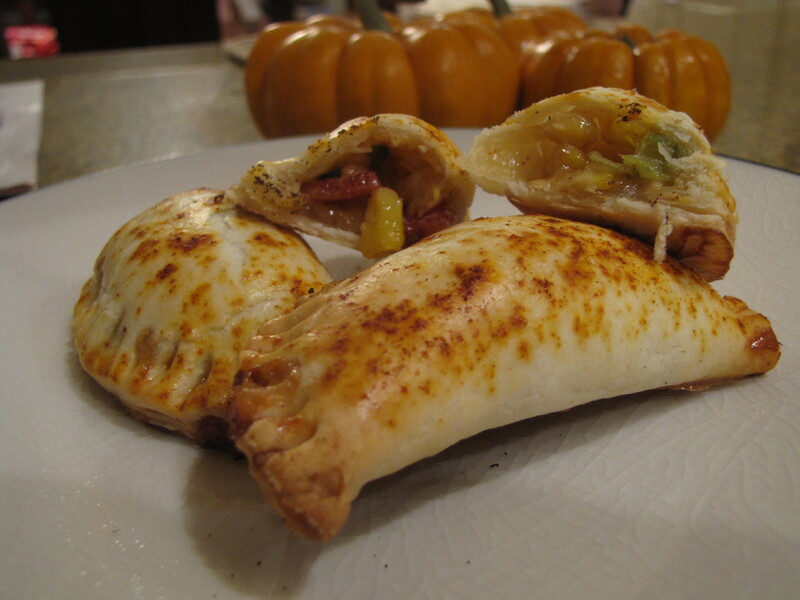 So, either get twice the pie crust and make more, make half the filling, or make something else with the leftovers. 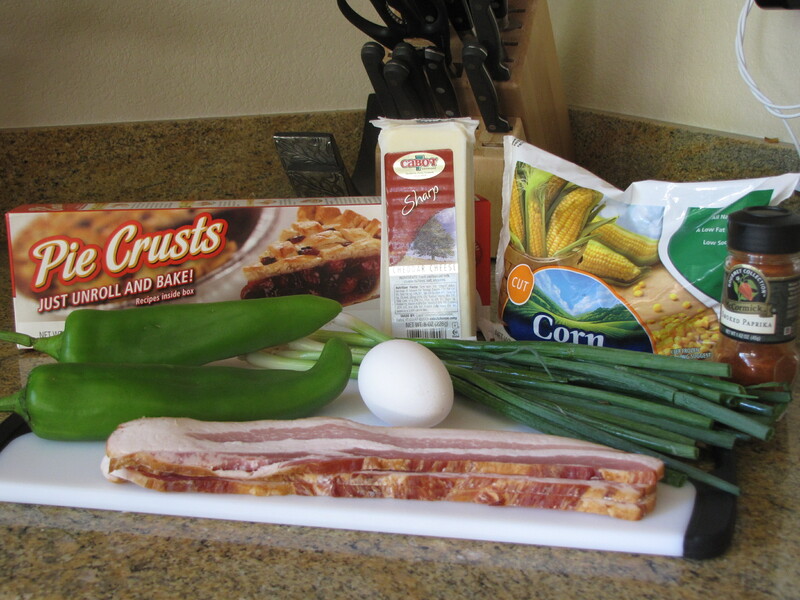 I can’t wait to make an omelet tomorrow with my leftovers. You are supposed to get 16 empanadas from this recipe. 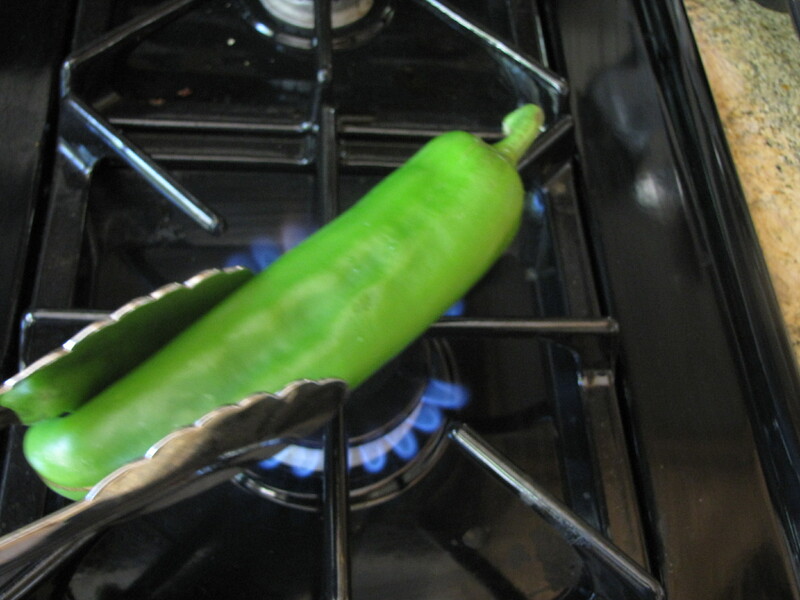 In a bowl, cover with plastic wrap, steam chiles for 15 minutes. 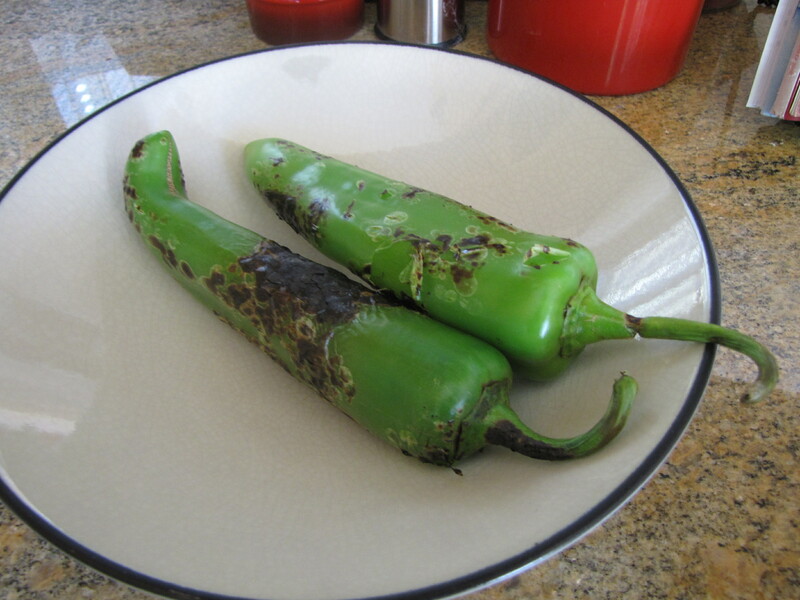 Peel chiles: discard skin. Slit chilis lenghtwise, scrape out and discard seed. 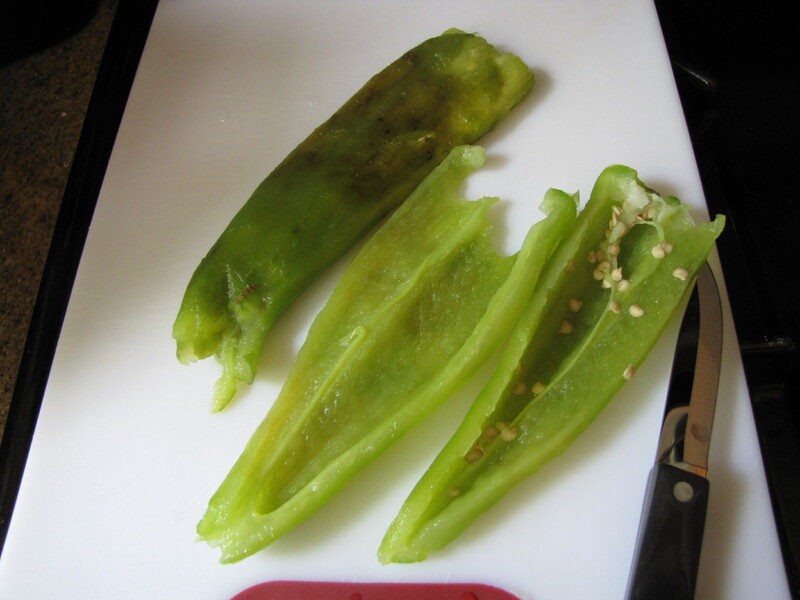 Remove stem and dice chiles, set aside. Fry bacon in a saute pan over med-high heat until crisp. 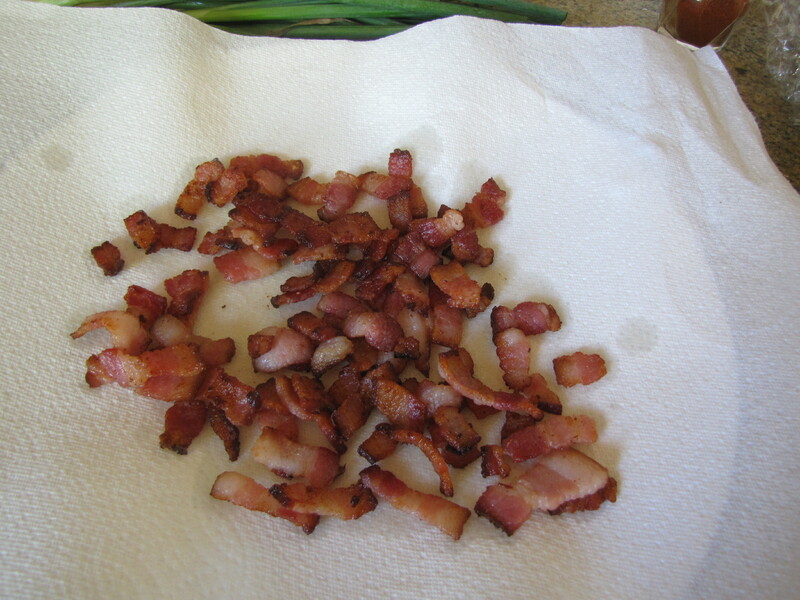 Using a slotted spoon, remove bacon and set on a paper towel lined plate. Pour off all but about 1 Tbsp. 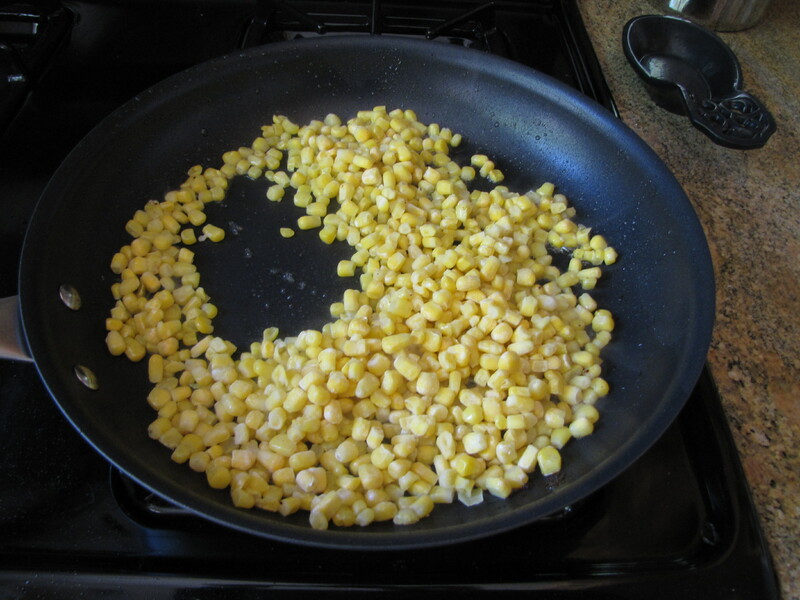 fat from pan; add corn; saute over med-high heat until edges of corn begin to brown, about 8 minutes. 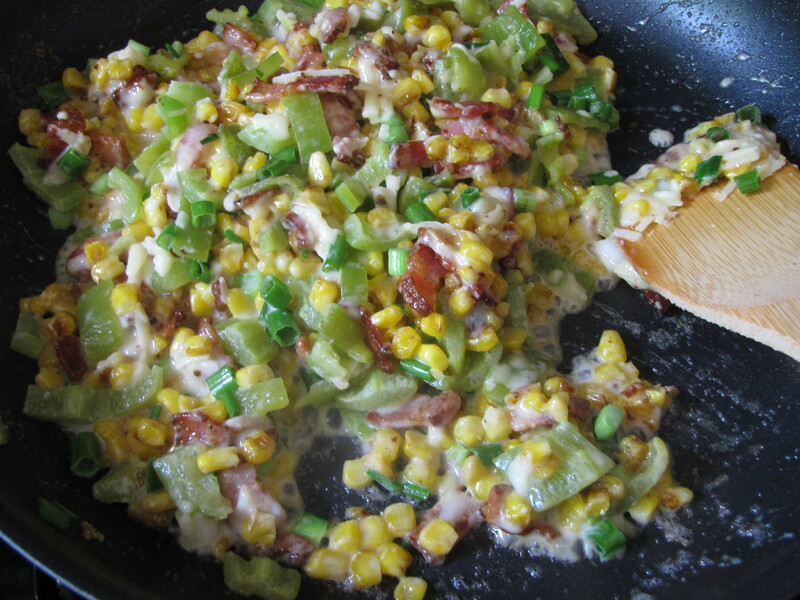 Stir in bacon, chiles, cheese, and scallions. Chill filling thoroughly. Preheat oven to 400. Line a baking sheet with wax paper. 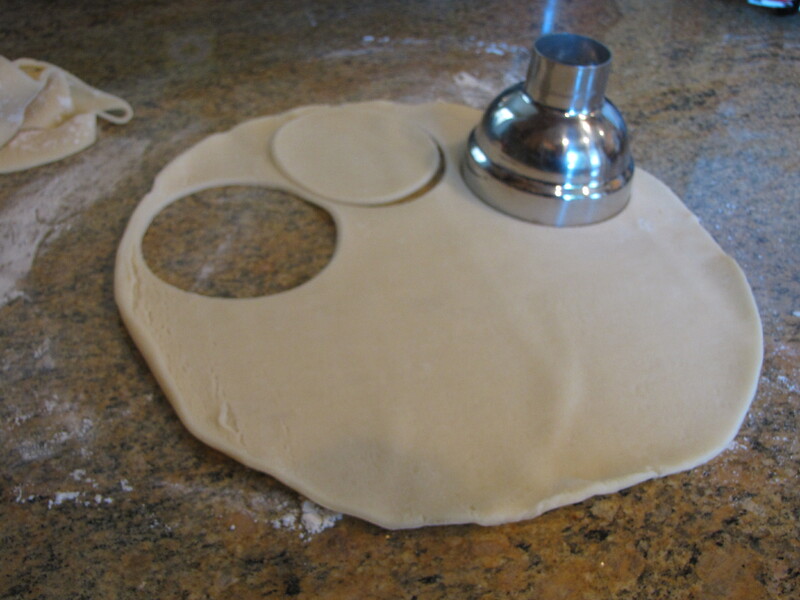 Unroll 1 sheet of pie dough onto a lightly floured surface. Using a 3 1/2 inch biscuit cutter, cut circles from dough; repeat with remaining dough, rerolling scraps as needed. If you don’t happen to have a biscuit cutter, the top of a martini shaker is exactly 3 1/2 inches and works perfectly. Place 1 Tbsp. filling in the center of each round. 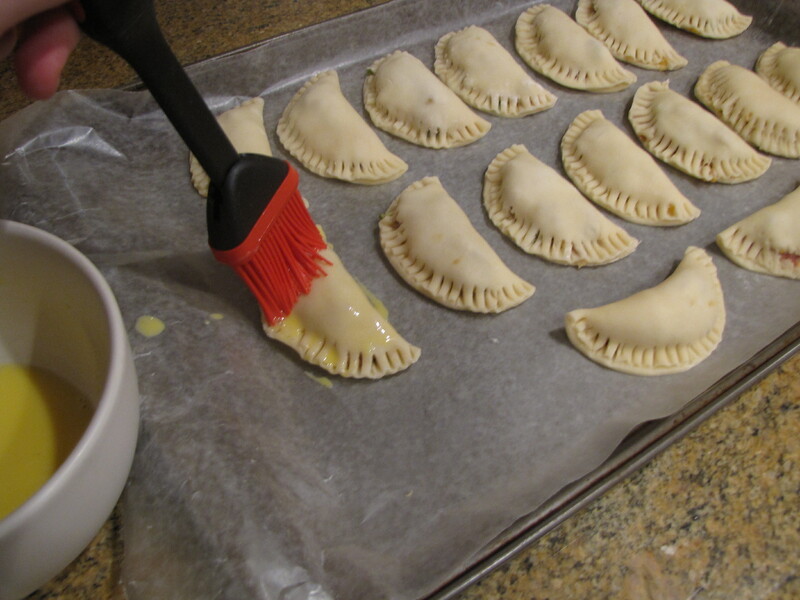 Fold rounds in half, pinch to seal, then crimp edges with fork to ensure they stay sealed while baking. At this point, freeze if desired. 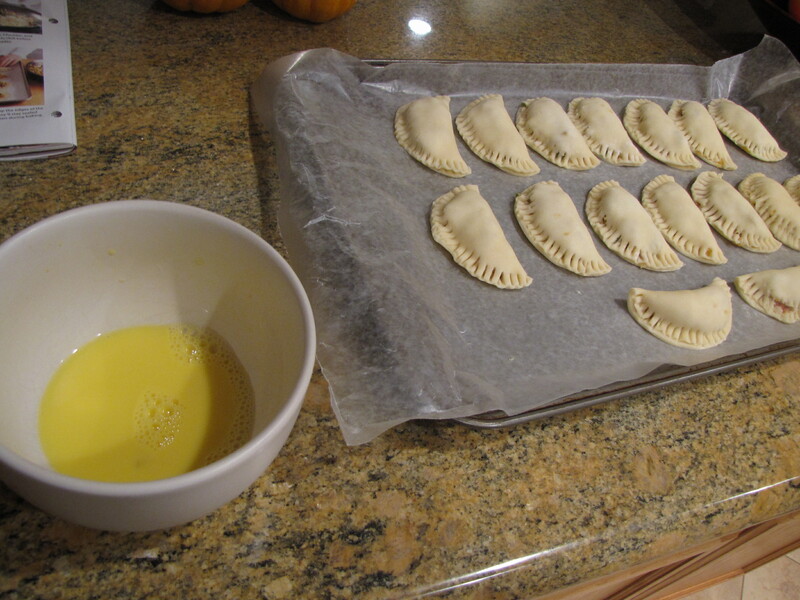 Blend egg yolk with water and brush on empanadas. 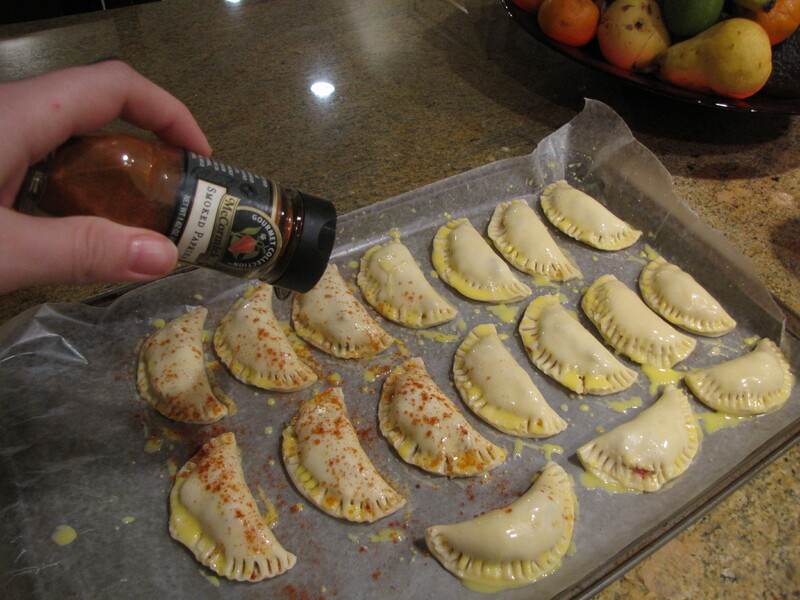 Sprinkle empanadas with smoked paprika and bake until golden, about 15-18 minutes.